Bioavailability, versatility and flexibility are important adjectives you want to have on deck when you’re talking about supplements. 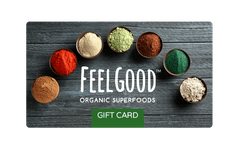 With our busy lives and desire for purity through conscious eating, Feel Good Organic Superfoods™ is happy to offer you several healthy additions to your smoothies, juices, and home-made remedies. With the help of sustainable farms who focus on organic growing and processing methods, we can assure you the very best from seed to powder. Packing our nutrient rich powders into reusable, recyclable, dishwasher and microwave safe containers is standard for us because taking care of our planet as well as our bodies, is how we Feel Good.